Line your two tins with foil and cut two triangular pieces for the legs. Take the goose and untie the string around the parsons nose area and fill the cavity of the goose with chopped green top of leeks and some cooking apples, add thyme or rosemary and seasoning. It you don't like leeks you can use onions instead. Prick the FAT GLAND under the wing of the goose and around the back of the goose by the parsons nose . If you wish you can add stuffing of your choice and put it into the cavity of the goose. Melt some goose fat in a saucepan, cool and pour over the legs before you place the foil on top of them or you can use butter or cooking oil if you prefer. After the first hour turn the goose so the back is upwards. Unwrap the back of the goose to let it brown. Pour over surplus goose fat, this is when you can put the goose into the second tin and then you have the spare fat for roasting your parsnips and potatoes. Remember to keep the legs covered and place back into the oven. Just lightly place a piece of foil on top of the back. Depending on the size of the goose approx. 3/4 - 1 hour more cooking. Turn the goose back again on to rack and add no more extra goose fat to the tin. Cover with a little flour and salt to crisp the skin of the breast - do keep the legs covered - this takes approx. 30-45 minutes depending on the size of the goose and how hot your oven is. 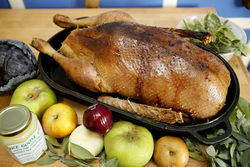 Lift the goose onto a carving dish to rest for approx. 20 minutes before carving - keep the goose covered. Place your stuffing balls, roast potatoes, roast parsnips and put some sage, green bay leaves and rosemary around the edge of the dish to make it look something extra special. A fan oven is much quicker so keep an eye on your goose. Cooking temperature is either 200°C / 400°F or gas mark 6. Aga etc., Hot. A useful tip is to have two roasting tins, as it makes it easier when turning the goose. Line both tins with cooking foil and cut two pieces triangular shape to cover both legs while the goose is cooking. The cooking times vary slightly according to the type of oven you cook the bird in. For cooking times see Buying your goose or turkey.